24 to 28 July 2011. This was a holiday about 6 months in the planning. I bought my air-ticket sometime in February when Air Asia had a good price on a direct flight. It was to be my first proper trip into Indonesia (apparently Batam doesn’t count). Work has been a little mad and I was craving that little bit of space. This trip out was a respite much needed. Joe who initiated the trip had to reschedule so it was just lil Nat, her colleague Noi and I. We didn’t plan to do much but got more than we bargained for at the end of the trip. My main thing was to meet up with some friends and I wound up making more new ones. Natalie, Noi and I upon touch down at the Bandung airport! I spent most of the time hanging out and reconnecting with friends. (Mostly musicians I’ve met through work from the last few years.) It was so obvious that our love for pop culture, music and our life philosophy speak greater volume than language. Whilst we sometimes worried about being misunderstood, words used in approximation do just as well when you are feeling the same vibe. I like that all over the world, I have friends who’re just like me even though we are of different cultures. We listen to the same music, we love life the same way. 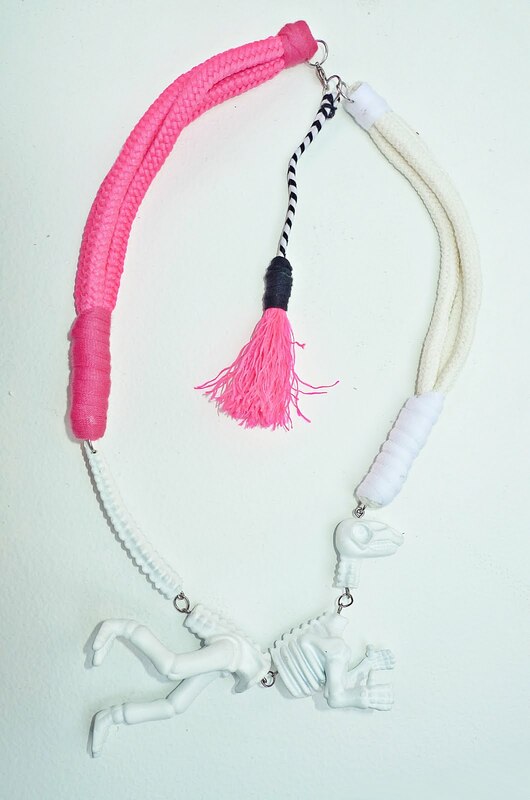 I bought a necklace made by MANNEQUIN PLASTIC from Lou Belle Shop and when I said I so loved THIS on the Mannequin Plastic site, they made me one! AND gave it to me for free! Now I own 2 of their creations! One green plastic cat and a pink/white T-Rex! Young & energetic young artists who gave me an awesome necklace! Bandung – so young, so creative! I’ll be back again! Categories: Rants & Raves | Tags: bandung, holiday, indonesia | Permalink. I’ve never really thought of going to Indonesia before, but maybe I will look into it now. Bundang looks like it has a really cool indie/alternative culture. It does! And it’s really super affordable too! Bandung is known as the indie pop capital of Indonesia! The boyfriend told me about it last year but I always look at him with tolerant amusement (never trust the boyfriend on fashion) but now I am going to take note of the places and demand he brings me there! Hope I manage to find the indie shops!